Even National and European elections in Belgium won’t keep me away from things that really matter and actually bring people together, despite difference in nationality. Single Origin Chocolate! Time for another review! Today we visit Canada once more. My bag of treats from over the pond isn’t empty yet. Not by far! Hummingbird states on its bars: Industrious, not industrial. 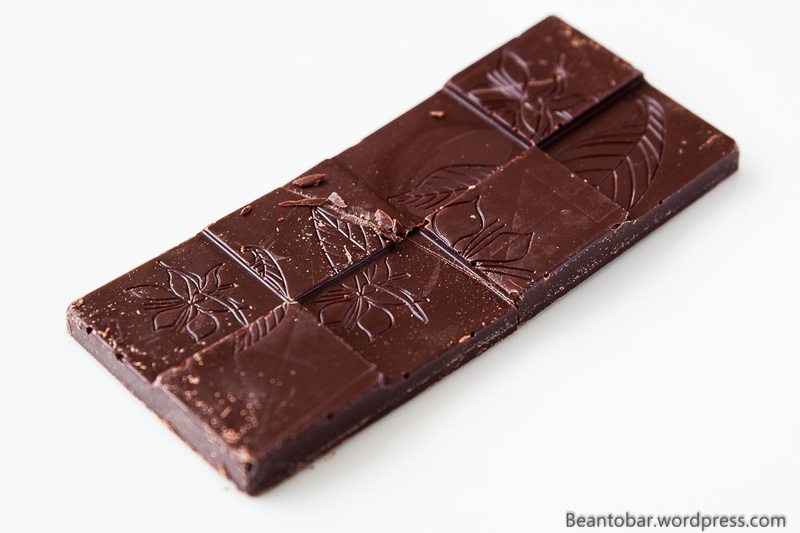 They take the slow, old way to produce chocolate and “tease” out the best flavors. What a wonderful way to describe what these artisan chocolate makers actually do. Drew and Erica Gilmour traveled all over the world working with farmers across the globe. At one time Drew came into contact with cacao on Haiti and they discovered the secret world of the new artisan chocolate scene. From interest, chocolate making soon became a passion and turned into a mission. To let other people enjoy the incredible taste varieties in quality chocolate. This Hispaniola bar is the first I try from these inspired people. The small size bar is wrapped in a light yellow sleeve. Their wonderful logo proudly sits on top, followed by cacao percentage and the name of the bar. I love how they create a distinct name for each bar, rather than using the origin. 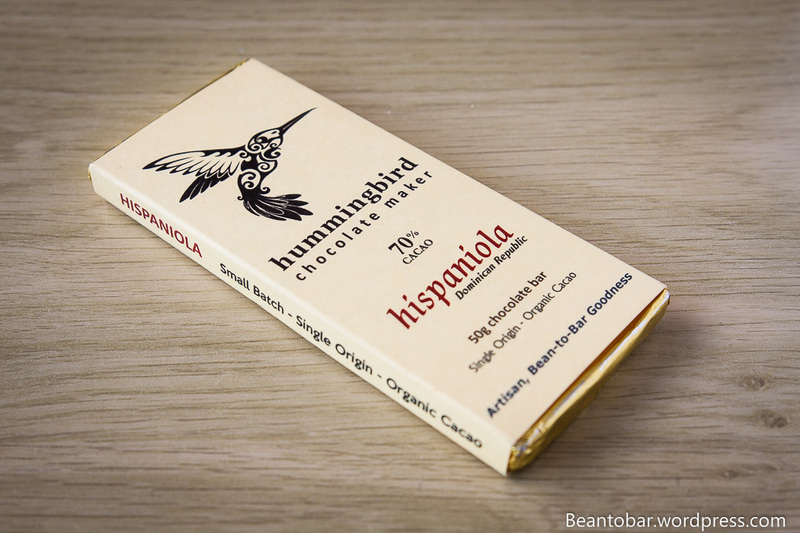 The Hispaniola bar features Trinitario cacao from the Dominican Republic. The bar can be pushed out of the sleeve and is hidden in a golden foil. While I like the presentation, it is a bit tricky to rewrapthe bar after some pieces. Not only the packing seems familiar, the actual bar aswell. They use the same nice looking design as The Chocolate Tree in Scotland. Stylish, yet I love it when a chocolate maker put the bar design to his own hand. While off course this isn’t the most important thing in chocolate, because all that really matters is the taste. Taste: A swift starting bar with a flash of slightly roasted tones and molasses, followed by a great dot of sour cherry, before vibrant coffee kicks in. 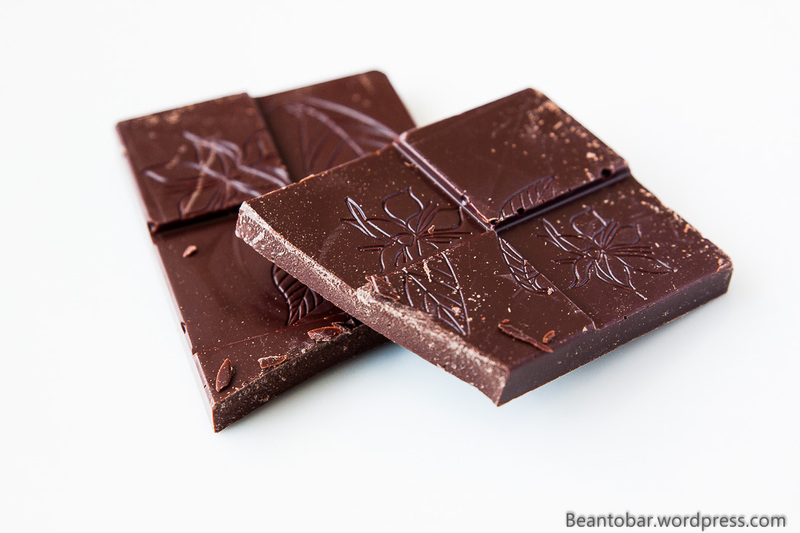 The chocolate overwhelms your senses in a heartbeat with sudden, yet fluent aroma changes. The melt is pretty slow, releasing fresh cherry flavor time after time followed instantly by more subtle tannins, creating a wonderful sour/sweet experience with a refreshing feel to it. 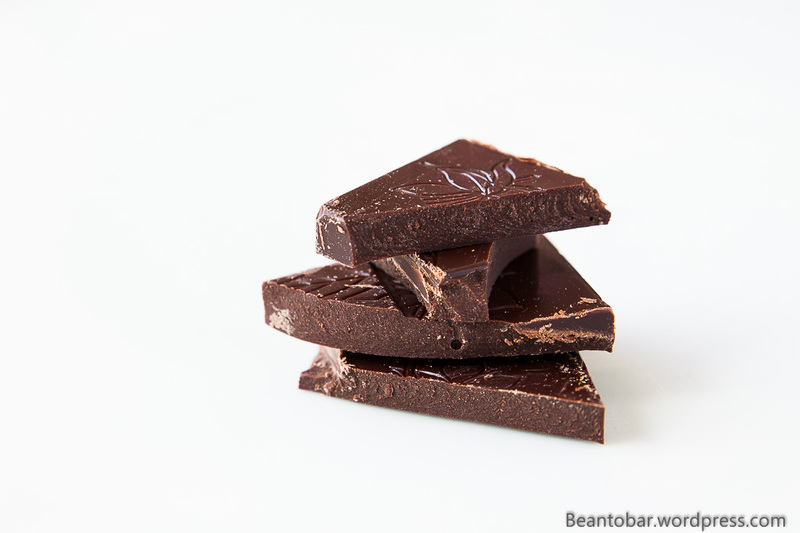 The texture is a bit drier than most french style chocolate, without being brittle and remains very pleasing indeed. The aftertaste concentrates on the coffee and tannins, with a warm slightly spiced back drop taking over after a short while. When you pay close attention, even here the cherry aroma faintly emerges again. Hummingbirds Hispaniola bar is a wonderful joyride, offering a great fruity experience while being full-bodied at the same time. Starting of fresh and sour/sweet it gently turns over to a warm end note. A piece of chocolate I enjoyed to the fullest! Thank you for sharing your chocolate trip with the rest of us! I really enjoy following your reviews, and also wish finding these bars weren’t so difficult. Can I ask how you were able to get hold of this one? Is there a US supplier willing to ship across the pond that I may contact as well? Actually I get most of my American chocolate through a New York lady with whom I swap bars. It is hard to find the bars this side of the pond. Keep in touch and I’ll see how I can help. Thank you, Kris! I definitely will. By the way, do you get the Canadian bars from her, too?